It rained today, on St Swithin’s Day. It hasn’t rained here for almost a month, then, today it rained. It was St Swithin’s day. If it rains on St Swithin’s, it’s supposed to rain for forty days. I suppose my shorts can go into the washing basket now along with the tee shirts and the short sleeved shirts. Might as well get the Bergy jackets looked out and the wellies. I should really start to sandbag the doors front and back to hold back the torrents. However, on looking on the bright side, I can put away the garden hose almost until September! If you believe the superstition, that is. What if you don’t? Does that mean it won’t rain on you? Will you have a little invisible umbrella shielding you from the downpour that’s soaking all the ‘believers’ ? I’ll go with that view. I’ll be an unbeliever, even if it means I have to keep watering the garden. It was good to see the rain today, even if it wasn’t all that heavy. It was good to see the streets looking black again. Good to see the soil soaking up the moisture. I even put on my ‘rainy coat’ and went for a walk across to St Mo’s just to say I’d been out in it. The ground had that lovely smell of rain on dry earth that only comes after a long, hot, dry spell and the rain wasn’t cold. I even wore my shorts to better feel the warm rain. 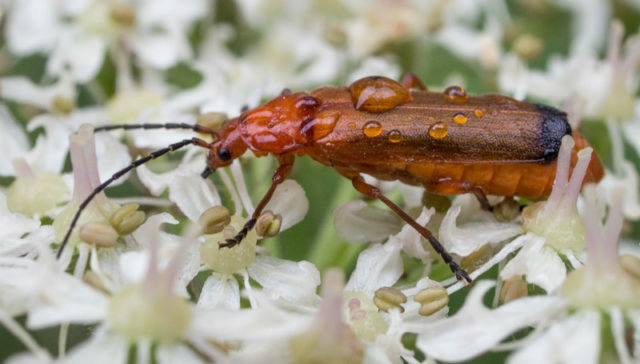 I managed to get some shots of a damp Soldier Beetle sitting on a Cow Parsley head and remembered that my mum used to call Cow Parsley, Dug’s Flourish. I never did find out why, but when I Googled the english version ‘Dogs Flourish’, back came confirmation from a few places on the Central Belt of Scotland, each with different possible reasons for the name. What’s in a name? Under Scamp’s tutelage I cooked some stew using a combination of her mum’s and my mum’s methods. It worked, of course. With that lineage, how could it fail. That was dinner tonight. Something simple and homely. For me, Potatoes, Stewed Steak and Calabrese which is a variety of sprouting broccoli. Scamp substituted Ratatouille (or Rats) for the Stewed Steak. Both seemed to go down well, resulting in clean plates. The rain persisted almost all day but is fading away now as darkness falls. Don’t know what we’re doing tomorrow. No dancing because it’s Glasgow Fair Monday and although nobody bothers with ‘The Fair’, the STUC building is closed because it’s a local holiday. Old habits die hard.